Made in Australia, Oceania, 1972-1996. This Perspex door handle is from the North Sydney head office of Clyde Industries Limited, parent company of Clyde Engineering from 1972 until the office was relocated to Chatswood in December 1996. The handle features an inlayed representation of the phoenix bird, the symbol of Clyde Engineering which was an iconic feature of the state’s industrial landscape for over a century, particularly in locomotive manufacture and servicing. 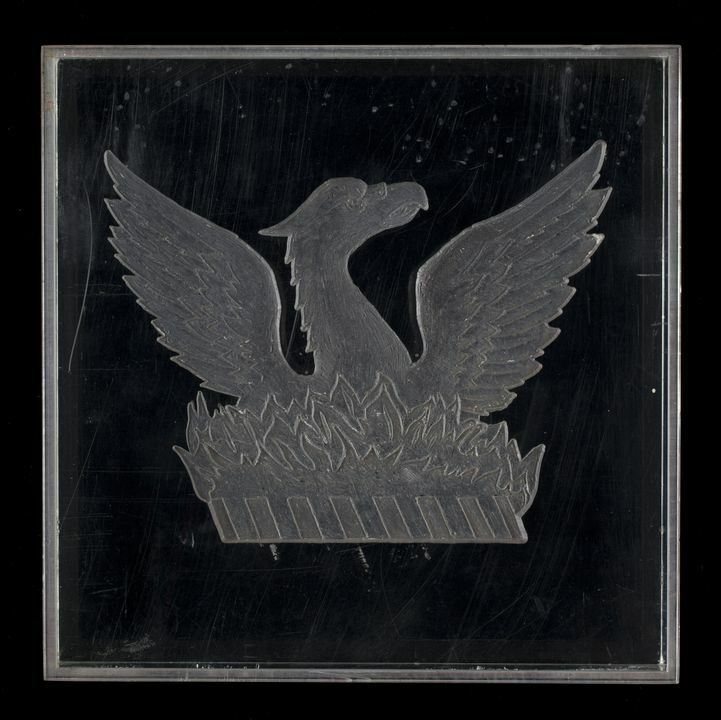 Square block of polished acrylic with edges featuring a narrow rebate and an inlay-carved phoenix bird design with unpolished tool-cut finish on front face. Door handle, made by an unknown maker in Australia, probably between 1972-1996. The door handle would have been made from a block of poly-methyl methacrylate (known most commonly by the commercial name "Perspex"), cut to the required dimensions, rebated on the edges and polished. The phoenix bird would probably have been created using a high speed steel or diamond-tipped tool to create the inlay carving. To achieve the accuracy required, it may have been necessary to first make a mould of the phoenix bird in relief in wood and then create an inlay or "negative" of this mould as a template. Using a stylus tool connected to an articulated arm which in turn would be attached to the high speed cutting tool, the inlay carving could have been created in the Perspex block by tracing the shape and depth of the inlay mould template with the stylus, which would have been replicated by the cutting tool. This door handle was one of two that adorned the glass entrance doors of the head office of Clyde Industries Limited at 140 Arthur Street, North Sydney. "We are all familiar with our company's Phoenix symbol. We see it on our letterheads, in our advertisements, on locomotives and hundreds of other Clyde products. But what does it mean? The Phoenix, a fabled bird from the mythology of Ancient Greece, represented the sun. Only one Phoenix existed at any time and it was always male. It was larger than an eagle and it had brilliant gold, reddish and purple feathers. After living for 500 years (some scholars said 97,200 years), the Phoenix burned itself on a funeral pyre... and rose from the ashes with a renewed vigour, youth and beauty. The new Phoenix carried the remains of the old to Heliopolis, the ancient city of the sun, and offered them up on an altar to the sun. For, like the sun, which dies each evening to rise again in greater brilliance next morning, the Phoenix is a symbol of immortality and spiritual rebirth." (Murray, James, "Phoenix to the World: The Story of Clyde Industries and Sir Raymond Purves CBE", Playright Publishing Pty Ltd, Sydney, 1992, rear dust jacket). (1) Clyde Engineering Co. Pty Ltd registered the phoenix as their company seal in October 1898. It was designed by John Saw for a fee of £4 (Murray, 1992, p34). (2) Clyde also used the phoenix as their emblem around 1899. It was manufactured from cast iron and firstly applied to steam trucks. (3) Clyde Engineering Co. Pty. Ltd. was removed from around the periphery and replaced with just "Clyde" under the emblem when Clyde Industries was registered in 1949. (4) The phoenix emblem was then etched on brass plate and coloured. (5) The phoenix emblem underwent many minor changes until it was modernised in December 1996. (Refer Museum object no. 2008/14/1, production drawing no. 259000001). (1) 1949: Clyde Industries registered and located at Ocean Street, Edgecliff, New South Wales. (2) 1969: Clyde Industries moved to Australia Square, Sydney. (3) 1972: Clyde Industries move to their own building at 140 Arthur Street, North Sydney, New South Wales, where the door handle was featured on one of the two main entrance doors. (4) 1996: Evans Deakin Industries (parent company of Walkers Limited) took over Clyde Industries. (5) 1996: Clyde Industries moved to Chatswood, New South Wales. (6) 2001: Clyde Industries, Walkers Limited and Evans Deakin Industries merged to become Downer EDI Rail.